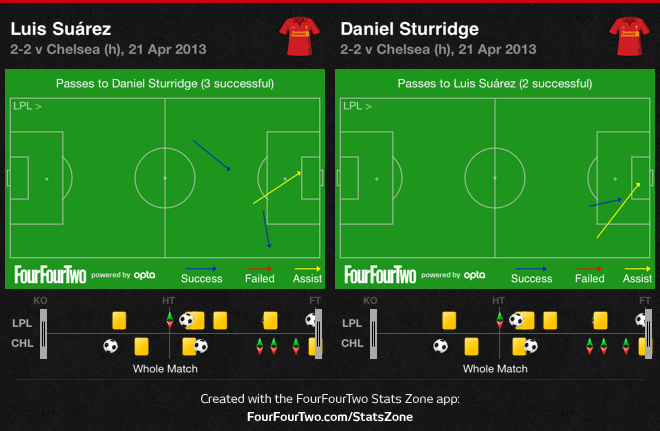 Liverpool trailed for long periods, but Daniel Sturridge and Luis Suarez combined very effectively in the second half. Brendan Rodgers left out Sturridge, favouring Stewart Downing in the only change from last week’s 0-0 draw at Reading. Rafael Benitez’s side was fairly predictable, although he selected Fernando Torres upfront against his former club, despite the fact Demba Ba is cup-tied for Thursday’s Europa League game in Basel, meaning Torres will have to start in Switzerland too. Chelsea dominated – and were ahead – for long periods, but eventually Liverpool clawed them back. There was inevitably a great deal of focus on Rafael Benitez on his return to Anfield, but in a tactical sense this match was all about Rodgers’ decision-making. There was very little to discuss about Chelsea’s formation – it was the usual 4-2-3-1 with Benitez’s first-choice central midfield combination and attacking three. Chelsea often tried to hit long balls in behind Jamie Carragher for Torres to run onto, with Juan Mata dangerous without being close to his best. The only substitutions Benitez made were within the last 15 minutes, replacing his three attacking runners with fresh legs. Rodgers’ selection in recent weeks has been interesting, and his choices for this match were particularly surprising. Broadly speaking, we can assume that his starting XI for the game last week against Reading – a poor side who don’t defend effectively without the ball – was his ideal attacking line-up. At the Madejski, there was no need to compromise attacking potential for extra discipline or defensive energy in the front four. That XI had three dangerous attackers – Coutinho, Sturridge and Luis Suarez. Coutinho started as the number ten, Suarez upfront and Sturridge out on the right, but they were given freedom to rotate. Jordan Henderson played from the left, moving inside to become a third midfielder. Liverpool didn’t score, but they did force Reading goalkeeper Alex McCarthy into one of the best goalkeeping displays of the season, and the combinations between Suarez and Sturridge, in particular, were extremely promising. That was a very different line-up to the one we saw away at Arsenal – where, once again, Liverpool didn’t win but did a lot of things very well. There, Suarez was left and Sturridge upfront, with Henderson deployed in an ‘advanced destroyer’ role – contributing in attack but doing his best work without the ball, energetically pressing from the front and helping to disrupt Arsenal’s short passing from the back. Henderson’s not overly creative, but he can do a functional job when needed in that position. Rodgers’ starting line-up seemed completely illogical. On a basic level, it was a shame to disrupt the attacking quartet that had performed promisingly last week – by bringing Downing in for Sturridge, he was presumably hoping for more discipline against a good passing side. But the format of the attacking midfielders made little sense. Chelsea’s problem deep in midfield, as discussed previously, is that they don’t really have a deep-lying playmaker – John Obi Mikel is about strength and positioning, Ramires about energy. There was no need to field Henderson in the centre, because there was relatively little to disrupt. Similarly, fielding Downing on the right was a peculiar move. Left-back Ryan Bertrand is a decent enough player, but is young, inexperienced and lacks Ashley Cole’s technical quality in possession. 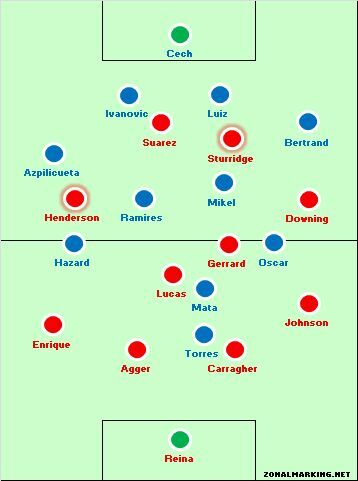 Rather than using Downing there, it would surely have been more logical to attack Bertrand with a proper forward – ie Sturridge, in the role he played last week. 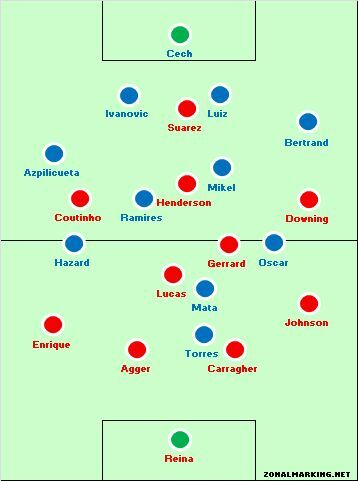 The only logical use of that front four (Downing, Henderson, Coutinho, Suarez) was if Rodgers was highly concerned by Chelsea’s three creators, and wanted to defend with two compact, narrow banks of four, with Downing and Henderson wide, minimising the space between the lines like Manchester United did against Chelsea, and then attacking with pace through Coutinho and Suarez. 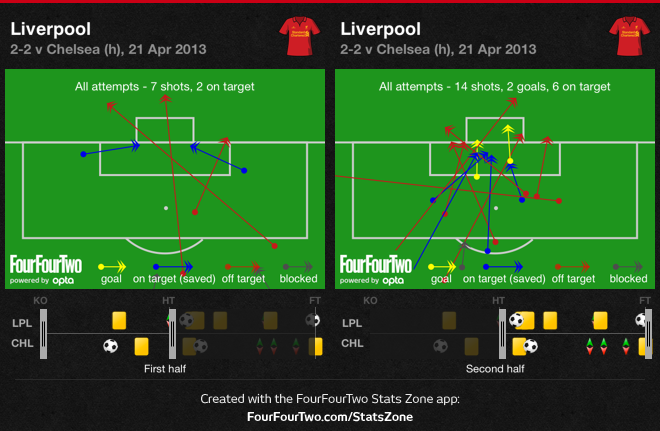 But with the surprising format of the front four, Liverpool were extremely poor in the first half. Henderson seemed confused by his role, Downing didn’t play badly but didn’t test Bertrand properly, while Coutinho was pushed back into a deep position by Cesar Azpilicueta, who was the one player Rodgers could have understandably used a functional player (Downing or Henderson) against. Chelsea weren’t rampant – their only first-half goal came from a corner – but they were the better side. They just about shaded possession before the break (51%) which is unusual for an away side at Anfield this season, and recorded four shots on target to Liverpool’s two. At half-time, Rodgers belatedly introduced Sturridge. It was surprising he decided to sacrifice Coutinho at the break – he’d been quiet, but partly because of his role in the side. Henderson moved to the left. Sturridge’s introduction was the game’s key moment – he was brilliant from the opening moments of the second half, creating a great chance for Steven Gerrard after a burst of speed, then hitting the post from long-range, before turning in a brilliant Suarez cross for Liverpool’s second. Liverpool weren’t tremendous, but Sturridge and Suarez’s link-up play was extremely good – and they eventually got a second equaliser with the reverse combination – this time Sturridge assisted Suarez. Both goals came from the right – the side of the pitch the duo had worked in so successfully against Reading. The game was as simple as that – Liverpool looked lost in the first half, then rediscovered their attacking abilities once Rodgers changed his system. Some credit should go to the manager for that adjustment, but this wasn’t really a tactical battle between Rodgers and Benitez, despite the pre-match talk about Liverpool past versus Liverpool present, and more about Rodgers’ uncertain selection. How often have we heard Liverpool not getting things “right” in the first half, faulting the manager for that, but then giving the manager praise for fixing things in the second half….. and this has been going on before Rodgers took over. Is there something about this squad that perpetuates this trend? Is their roster filled with players not “strong” enough to impose their football on the match but more suited to reactive tactics? I would say it’s a tactical/psychological remnant of the Benitez era (maybe from even further back, but I didn’t watch Liverpool pre-Rafa). His best side, the runners-up in 07-08, was a fantastic counter-attacking, ‘reactive’ team. Maybe, on a subliminal level, some of the players bring elements of those tactics into their current style of play. Helpful tips. Lucky me I came across your web site unintentionally, and i am shocked why this accident would not was held ahead! I bookmarked it. focused net viewers for your on-line company. AdzZoo is correct for you?